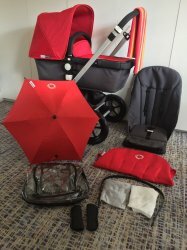 This listing is for a stunning Bugaboo Cameleon 2 pushchair. The base fabrics are in charcoal grey. The hood, seat inlay and pram apron are in red. They are in great condition, with no fading, marks or damage. The charcoal base fabrics are also in very good condition with no marks or damage.